"That's all going to change starting next year. This time it's the masses that get the upgrade first. While Nehalem launched with expensive motherboards and expensive processors, the next tock in Intel's architecture cadence is aimed right at the middle of the market. This time, the ultra high end users will have to wait - if you want affordable quad-core, if you want the successor to Lynnfield, Sandy Bridge is it." The huge force that is Intel continues moving along at a steady pace. 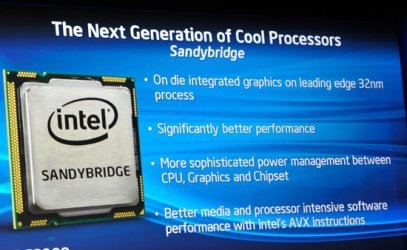 While AMD is fighting back with its Bobcat and Bulldozer chips, Intel's Sandy Bridge seems to be a continuation of moves first seen with the Core i3 and i5 processors. Processing power is increasing, as expected, but the integrated graphics are what have caught my eye. While integrated graphics offered low power consumption and great 3D performance at a great price, its 3D capabilities were laughable at best. While Sandy Bridge will not be toppling the discrete GPU market, it is edging into the lower end and that means that the lowest bar for computing will offer something worthwhile. Programs like Google Earth will run even more smoothly, and 3D accelerated browsers are right around the corner. We might be watching the next push in computing fads!